As my official #2 recommendation, the Havahart Spray Away 2.0 is a solid motion sensor sprinkler that will appeal to a lot of buyers due to it also being one of the cheapest models available. In fact, the only cheaper model that you can buy online is the PestBye Jet Spray which has a lower range of spray, only 19 total reviews on Amazon, and many complaints about leaking, poor construction and issues with the sensor. So, if you are not familiar with how everything works, you just need to connect a garden hose to the sprinkler stake/tube. The front of the sprinkler has a motion sensor which can detect when something moves in front of it. In this particular model you can actually turn the sensor up or down depending on what type of animal you are trying to repel. Because this model is connected directly to a hose, you get unlimited sprays for the life of the batteries (4x AA). It covers 1900 square feet, but in my experience, some bolder animals will not be deterred by a couple sprinkles of water! For a large area, you may need more than one unit. Some complaints about the Havahart Spray Away 2.0 is that it leaks, doesn’t work well in morning/evening light, and there are issues with the extension tube. There are just as many positive as negative reviews. 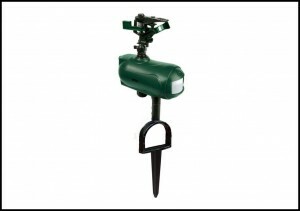 If you are looking for a budget option, this sprinkler is going to be your best choice. However, if you are willing to spend an extra $20, then the Orbit Yard Enforcer is what you should get (my #1 recommendation). re havahart Just returned one to home depot and the second one will be going back too. device has a cheap hose connect that is apt to disconnect. On two occasions while at the cottage, came home to hose running full blast in the yard. For more than two days. Have a well so no expense but easily a few hundred dollar touch in the city. The hose connection cannot be tightened without stripping. I think the supplied gasket is too thick. Anyway buyer take care…I will not replace it with the same brand. Am going to try orbit. Thanks for letting us know Bill, and be sure to come back and let us know how things go with the new brand!